Woman’s Day was on March 8th and for many it may have not been so special a day or maybe your family made it special for you. Hubby dear spent the day questioning when is Man’s Day??? Several times my daughter fights not to be treated differently from her two siblings, but we just cannot help worrying a bit more for her than her two brothers. The world is still not safe for women. They are easy targets and its so easy for men to label them as cheap, brainless, provocative, asking for it, weak, animals, uneducated, selfish, etc. We have given our daughter the same opportunities as her brothers.However, we are just a bit more cautious and keep in touch with her more often than we do with the boys. If she gets home late from work we worry a bit, we ask her to leave mobile numbers of friends, hotel name, room number etc when she goes on holidays with her friends, rickshaw number and the drivers license number to be sent to friends or when taking taxis she has to call a friend to inform that she has left home and to call again when she reaches her destination. Women still constantly have to fight for basic respect whether you are a corporate leader or a home maker. If we do not teach our sons to respect and value women, then change will not come quickly. 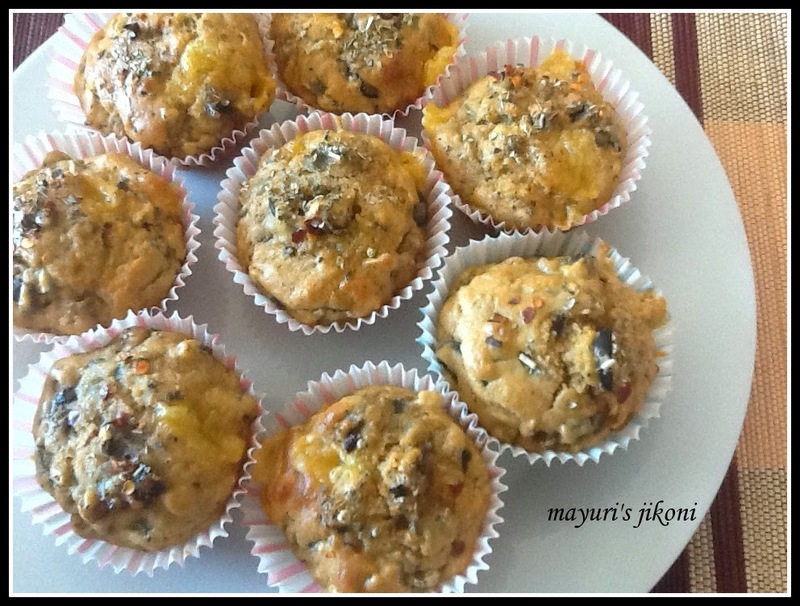 Home Bakers Challenge for the month of February was different types of savoury muffins. Though I have collected a few savoury muffin recipes I never really got down to making any of them. From the choices given, I loved the way the spinach feta muffins looked and decided to bake them. Though the family ate it up, the taste of the baking agent was just too strong. I will make them again but will not add the baking agent. In the meantime, I tried out the savoury pizza muffins and added ingredients that were at home. We had the muffins with the yummy yummy strawberry mango mesclun salad. The left over muffins tasted much better today! Do you worry more about your daughter than your son? Heat oil in a pan over medium heat. Stir the onion till it is slightly soft. Add the garlic and stir fry for a few seconds. Add mushrooms, mixing constantly, cook it for 30 seconds. Let the mixture cool down. Line muffin cups or muffin tray with paper cups. If you are baking without the paper, then grease the tray or cups lightly with oil. Sift flours, baking powder, sugar, salt together into a bowl. Add the chilli flakes, oregano and pepper and mix well. In another bowl add egg, milk and pizza sauce. Whisk it together. Add cheese, olives and the mushroom onion mixture to the egg mixture. Mix well. Add flour mixture and mix just enough so that the flour is wet. Do not over mix. Fill the prepared tray or cups ⅔ of the way with the mixture. Bake the muffins for 15 -20 minutes or till the tops are golden brown and a skewer inserted in the middle of one of the muffins comes out clean. Remove the muffins from the oven and place them on the wire rack to cool down a bit. Serve warm with your favourite salad. Add any vegetables that you may like… bell peppers, sweet corn etc. To make an eggless version add about ¼ cup thick yogurt. These muffins are excellent for kids lunch boxes, pizza taste but healthier than a normal pizza. Super Yummm. They look oh so good. Loving them through n through dear Mayuri. Perfect for my tea parties. Bookmarked.